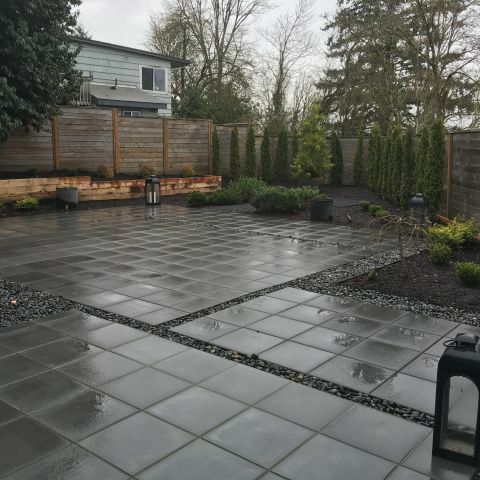 Again, here are some great patio insights, with this guest blog from one of our area's top landscaping design/builders, Ben Bowen of Ross NW Watergardens! As a landscape designer I spend a lot of time visiting neighborhoods all over Portland, and the trend is really sticking out: sleek modern homes are becoming very common. The typical home is changing. Obviously this is just a manifestation of changing tastes. Many young families want contemporary homes, spaces with clean lines and lots of light. And how about the spaces around these homes? Landscapes are becoming more modern as well. So how do you get the look you want? Many materials commonly used to create outdoor spaces don't look or feel modern. Others can be used, but have to utilized in just the right way. A small number of products are truly modern and can easily be used by anyone to create a contemporary landscape. Patios are often the centerpiece of a great outdoor space, so let's start there. How do you create your own contemporary patio? Concrete with a smooth finish or acid etching can be very sleek and modern. Some natural stone, laid in the right way, works well too. But neither of these are particularly DIY friendly. If you are going to do this yourself you want to look at concrete pavers. But which pavers will look right? There are a few good options, but the ones we use most often are architectural slabs, which come in a couple sizes, I recommend the 18”x18” ones. There's also a larger size, but many would find it too heavy to work with easily. Mutual Materials will deliver these to your home. Rent a compact track loader to move the pavers, and other materials, to the back yard. Don't get fancy with the pattern, you want the lines to be as clean as possible. You can break things up a bit by adding a touch of another material. Black beach pebbles blend really well with this material and concept. 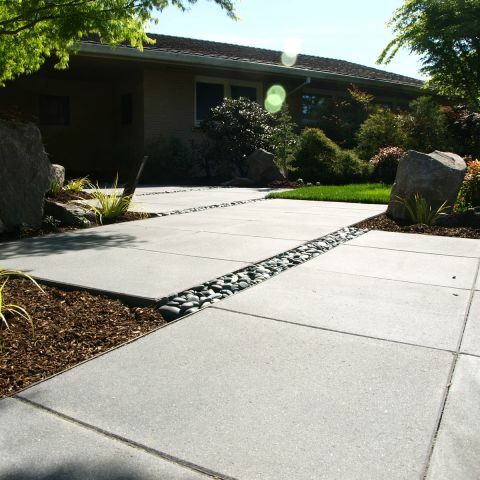 Most paver patios have plastic edging just below the ground. For a more modern look use 1/8”x3” steel edging. You can have this delivered from any local steel yard, and if you know the exact lengths you need, most likely the yard will pre-cut them for you. How do you choose the location for you patio? The first consideration is practical. How do you use the space? Where would people flow from when accessing the space? Sometimes the answer is simple because you just walk out your back door. But you may have a large deck with two sets of stairs and a daylight basement below. Think carefully about the most natural route to your new space. The second consideration is a little more subjective. You need to choose a “regulating line.” What's that? It is an imaginary line created by the lines of your home or existing landscape features. (FYI,Garden Design.com is a good resource for design principles). To establish your regulating line, Choose a window edge or the opening of a back door. Draw an imaginary line out into the yard, then locate your patio on that line. Play around with multiple lines and see what feels best. If you are unfamiliar with the concept it may take a little time, but if you choose correctly your new patio will create spaces that are pleasant and harmonious, balanced. What shape and size should my patio be? If you are using large square pavers it makes sense to stay away from curves. Keep things simple and stick with a rectangle for your patio. Notice I said rectangle, not square. There is a reason for that. If your patio is a rectangle you can ensure the proportions are correct, regardless of size. Use the Golden Ratio to guide you. For a rectangle this means your short side to long side ratio will be about 1:1.6. If you are upset that building a patio involves so much math then just get out your string lines and use them to lay out the edges of your patio. If you mess with the side lengths until the feel “right” you will probably be close to the Golden Ratio - without any math. The size of the patio should primarily be determined by use. How big does it need to be for the way you will use it? A patio that will house a cafe table and two chairs could be as small as 30 square feet. But if you have a large family, enjoy entertaining, and want to have a fire pit on the patio it had better be large! Using string to mark the edges and then walking around inside- maybe even bringing chairs into the space probably is the best way to figure this out. Can I really build my own modern patio? Yes, you can. Plan carefully, have the main materials delivered to your home, and utilize rental equipment to save your back. Start today and you could have a sleek contemporary outdoor space ready in time for a summer cocktail party. Or to house a sandbox and water balloon fight debris. Whatever works for you. Here are some tips on building your own paver patio! - Sod Cutter to remove lawn for your patio project. - Dingo Compact Track Loader for moving soil, gravel and pavers. - Plate Compacter to compact the gravel and pavers.